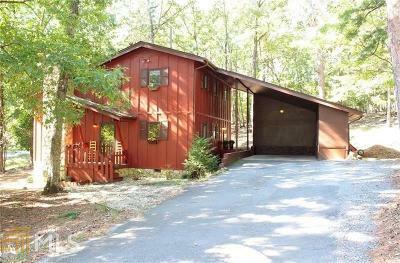 Nestled away in beautiful north Cherokee county. This gated community offers a quiet, spring fed private lake and marina. This well maintained 3/2 loft home boasts a beautiful stone fireplace to keep your warm on those chilly nights. The high ceilings and wood beam accents add to the charm of this unique property. Master is located on the main level that has new carpet. Upstairs you&apos;ll find plenty of room for your guests with two bedrooms connected by a Jack & Jill bathroom. Enjoy the natural setting and watching the abundant wildlife from your screened in patio. Directions: Waleska Road To Little Refuge Rd. Follow Approximately 3 Miles To Lake Arrowhead Gate. Check In With Guard.